Is it legitimate to tamper with images? 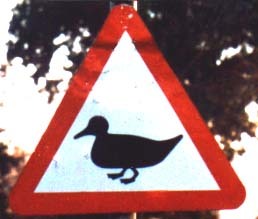 The duck above has had a stain removed. Would it have been alright if the sign itself had been cleaned? Should we promote equal opportunities in roadsigns? Should we deprecate the sort of sexist stereotyping we see in Spanish school roadsigns? Should signs represent things-as-they-are (schoolchildren running into the road, workmen standing in the road, working at the pavement), thus drawing drivers’ attention to dangers; or things-as-they-should-be (schoolchildren walking sedately along the pavement, workmen carefully avoiding the road), thus promoting safer habits among pedestrians?